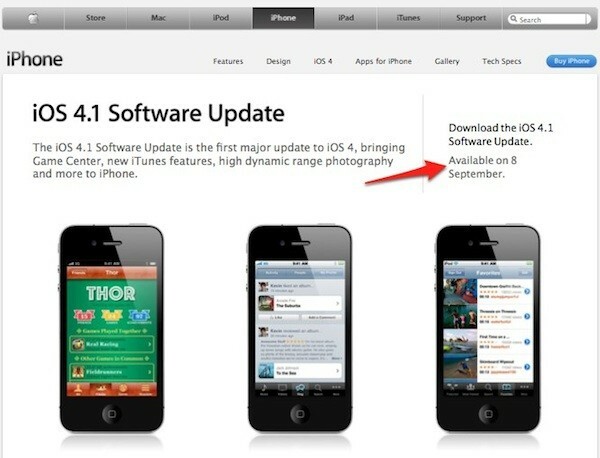 According to Apple's UK website , iOS 4.1 will hit devices on September 8th. Which will probably mean that the brand new iPods announced on Wednesday along side iOS 4.1 will be released on that day. iOS 4.1 brings many bug fixes to do with ?proximity sensor issue, Bluetooth, and iPhone 3G performance but it also brings many new features such as HDR photos, TV show rentals, HD video uploads over WiFi and Game Center.